How Much Does the 2018 Ram 3500 Cost? How Many Pounds Can the 2018 Ram 3500 Tow? What’s New for the 2018 Ram 3500? This heavy duty truck is now stronger and more capable than ever before. Compare it to the Chevy Silverado 3500 to see. It has a newly engineered hitch design that allows 30,000 pounds of fifth-wheel towing capacity. For this, the engine is a Cummins 6.7-liter diesel. It produces 930 lb.-ft. of torque, and it can best the comparable Ford F150. The truckmaker has noted that these upgrades make it possible for the trucks to do tasks previously relegated to Class 4 trucks. The conventional tow rating is a massive 20,000 pounds, and the gooseneck tow rating jumps to 31,000 pounds. The HEMI V8 power outlay is 410 horsepower and 429 lb.-ft. of torque. With the 3500’s sturdy build, this truck works hard to earn its place at your home or in your work fleet. More technologies are available, and a rearview camera is now standard across the lineup. A new Sirius Guardian subscription offers remote services with SOS, a Vehicle Finder and more. Three cab sizes and three bed sizes let you pick the configuration that best serves your needs. Ram’s MegaCab is especially spacious, giving you SUV-like comforts. Ten editions let you climb the trim ladder to the amenities most important to you. New trim levels are making headlines. A few years ago, it would have been hard to imagine the 2018 Ram 3500 Limited Tungsten. Now we know that truck shoppers like luxury too, and Ram is providing it with this top level trim. The leather-clad seats and handsome cabin boast some segment-first exclusives such as the suede-like headliner. Recognizing the farming community with a trim of its own, the 2018 Ram 3500 Harvest comes in exclusive colors. A special blue matches New Holland farm machinery while a special red matches Case IH machinery. A rear step lets farmers access the bed. Tubular side steps help you into the cabin. You’ll need a little assistance since this Ram truck sits an extra inch higher. More ground clearance is paired with skid plates, mud flaps and other necessary items to keep the vehicle out of trouble when it is off the road. Ram provides special on-road/off-road tires and four-wheel drive to make sure you won’t find yourself stuck in the field. To keep an eye on your cargo, Ram, also adds a cargo view camera to all 3500 Harvest editions. Both editions boast the full UConnect touchscreen system with navigation. Farmers will appreciate customizable weather information and maps. You get access to more smartphone integration features via Apple CarPlay or Android Auto, depending on your smartphone. This system also offers a WiFi hotspot subscription, a useful tool whether you are parked in the barn or far afield. 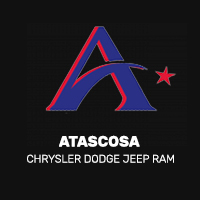 Visit your Atascosa Ram dealer for a closer look. Our staff can help you match your current needs to the appropriate Ram 3500. ** When properly equipped. See dealer for details.